Every page of J.Y. Yang’s newest TENSORATE novella, The Descent of Monsters (2018), carries a pervasive and steadily-increasing sense of dread. But when the primary character announces straight off that “You are reading this because I am dead,” it’s hard not to wonder how and why that comes to pass, and which event will be the one which ends Tensor Chuwan Sariman’s life. Note: It will help to read The Black Tides of Heaven and The Read Threads of Fortune before beginning The Descent of Monsters, in order to better appreciate the significance behind the appearances of Sanao Akeha, Sanao Mokoya, and the person called Rider. So, a Tensor is dead. A Tensor who was investigating an extremely strange occurrence at the remote Rewar Teng Institute, the halls and rooms of which are strewn liberally with gore, bones, and viscera, but have been stripped clean of notebooks, journals, and letters. Yang provides readers with a collection of found documents: Sariman’s journal entries, letters, missives, and interrogation transcripts which comprise her investigation process; some of these items are absurdly redacted, much to Sariman’s consternation. Sariman’s duty is to the truth, not the bureaucracy of her superiors, and when the investigation is closed (prematurely, in her eyes) she is spurred on by increasingly disorienting dreams and her own conscience to see things through, despite where this quest may lead her. What I loved the most about The Descent of Monsters was Sariman’s voice, which comes through strongly and clearly, and reads exactly like a flesh-and-blood person’s thoughts and reactions. She’s smart, insightful, foul-mouthed in the best ways, and wholly individual. Between her experiences and what Rider witnesses at the Institute, it’s obvious that something very big and very wrong is afoot, though Yang only skims the foul surface in this installment. Yang’s far-reaching empire of the Protectorate is endlessly fascinating, and seeing it through the eyes of a Tensor who is nominally in conflict with the rebel Machinists (but whose personal perspective reveals a blurring of lines and loyalties) further enriches and complicates both the world-building and the overall narrative. There’s a lot going on here, some of which must be inferred by the reader or is alluded to in terms of political unrest throughout the Protectorate and its neighboring countries, but it all comes together in a satisfying way by the conclusion of The Descent of Monsters while opening the door for further works. (A fourth TENSORATE novella is currently slated for release in early 2019, which seems like such a long wait!) 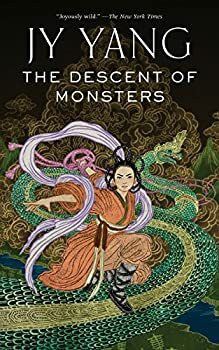 If you enjoyed The Black Tides of Heaven and The Red Threads of Fortune, you’ll very much enjoy The Descent of Monsters, and if you haven’t started reading the TENSORATE novellas yet, I highly recommend doing so. In The Descent of Monsters, JY Yang uses a new style of story-telling. Much (not all) of the tale is told through ephemera: reports, transcripts, letters and personal journals. This can be a tricky style to pull off, but Yang does it very well indeed. We begin to see the true scope of the evil and corruption of the Protectorate for the first time, as we journey though a landscape that borrows the disturbing sense of look-over-your-shoulder creepiness that I usually associate with writers like Jeff VanderMeer. You can understand and appreciate what’s going on in The Descent of Monsters without having read The Black Tide of Heaven or the Red Threads of Fortune, but it’s difficult, and anyway, why would you want to? These books are brilliant, with a unique and concretely realized alternate world, peopled with characters who are different from us in many ways, but share our flaws, our fears, our hopes and loves. The primary narrative voice is that of Tensor Sariman, an investigator assigned to evaluate the cause of a massacre at a Protectorate institute. Sariman is an outsider, a Kebang, and she has no illusions about why an investigation of this magnitude was given to her. The Protectorate wants things covered up. Unfortunately for them, Sariman is stubborn, and the only thing more stubborn than her is her conscience, even when she tries to drown out its voice with liberal applications of rice wine. Without committing spoilers, I will say the book relies a lot on strange and convenient (or inconvenient) coincidences. Sariman herself comments on this with exasperation. Once, while pursuing a person of interest, she trips and falls even though there is nothing on the ground to trip her. These plot elements, far from being lazy story-telling, are the signature of a very important part of the book, something that is revealed close to the end. And is Sariman dead? Dying, definitely… but dead? I’m not sure. If you are looking for something different and original with engaging characters who face complicated conflicts, you should try out the TENSORATE series. Published July 31, 2018. JY Yang continues to redefine the limits of silkpunk fantasy with their Tensorate novellas, which the New York Times lauded as “joyously wild.” In this third volume, an investigation into atrocities committed at a classified research facility threaten to expose secrets that the Protectorate will do anything to keep hidden. You are reading this because I am dead. Something terrible happened at the Rewar Teng Institute of Experimental Methods. When the Tensorate’s investigators arrived, they found a sea of blood and bones as far as the eye could see. One of the institute’s experiments got loose, and its rage left no survivors. The investigators returned to the capital with few clues and two prisoners: the terrorist leader Sanao Akeha and a companion known only as Rider. Investigator Chuwan faces a puzzle. What really happened at the institute? What drew the Machinists there? What are her superiors trying to cover up? And why does she feel as if her strange dreams are forcing her down a narrowing path she cannot escape? He announced on Twitter that he had a contract for the 4th novella but I don’t know the drop date. I’ve only read the first one, but how intriguing! Goodreads currently lists the publication date for novella #4, “To Ascend to Godhood,” as January 29th 2019, so we’ll see what happens. (BTW, Yang prefers the pronoun “they.”) If you haven’t read any of Yang’s work, Marion, I think you’d really appreciate their skill with wordplay and characters. I did not know they used they, so thanks for that! I read the first one and was quite intrigued. Will hunt up the other two. Anytime! :) Please let me know what you think of the other two when you get a chance to read them — there’s so much spoilery stuff, especially regarding character development, that I want to discuss!